If your equipment runs in a mission critical or high density server application, Eaton ePDU (enclosure power distribution unit) will provide the reliable power for both standard and blade servers in your data center. Eaton’s plug strips are available in both vertical (0U) and 19 inch horizontal rack mountings. 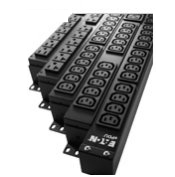 Eaton Basic PDUs allow for simple management and are a completely scalable solution. All ePDUs, including the Basic model, have an aluminum chassis and are built to suit the latest enclosure and rack designs. With the inclusion of fully shrouded circuit breakers the entire unit is completely earth bounded and mechanically isolated from electrical outlets. This prevents stress to the circuit board from repeated plugging and unplugging. Call or order online to get the plug strip you need.